“Ave” is the debut album from Heavy/Black Metallers Venom Inc. and was released August 11th, 2017. Now Venom Inc. aren’t quite new as they are mostly the “Prime Evil” lineup of Venom featuring Tony “Demolition Man” Dolan, Jeff “Mantas” Dunn and Tony “Abaddon” Bray. With two out of three original Venom members rejoining forces with the Dolan and returning to the Venom name(sorta), it is quite exciting. Personally, this album has been long enough of a wait so lets dig in and see if they can dish out a heavy record after all these years. 1.Ave Satanas- Opening with almost an ominous but epic fitting church choir sound, the song goes right into full heavy mid paced chugging. Mantas has some classic really grooving riffs here with Dolan spitting some really heavy lyrics throughout. I know a lot of people had a lot of mixed feelings about this opening song. Personally I think it is a great catchy sludgy metal tune with some old school feeling and definitely one that would be a great crowd pleaser. I also have to admit every time I hear Mantas go into his solo I get chills. He has always been one of my favorite solo guitarists for how how much feeling he puts in his solo’s. It isn’t always one that is super intricate but it has a lot of feeling and is heavy as hell. Overall, this is a great opener to the album with a fresh sound with the formula still being familiar. 2.Forged In Hell-The main riff for this song is almost a throwback in a way to “Welcome To Hell” but still has an original feel to it with almost a jam kinda pace with Mantas doing some cool fills. Abaddon I have to say has become one hell of a solid drummer performing drum rolls with ease. The chorus has a very NWOBHM-ish feel to it. This song is definitely a throwback in way to the early Venom albums but works very well. 3.Metal We Bleed-This song goes more into Blackened Speed Metal territory and feels like it easily could have came out in 1988 with a pace that is oh so infectious. It is also a tune you could sing to as well with Dolan spitting lyrics fast and furiously. This is easily one of the best tunes on the album simply for how ferocious and neck breaking it is. 4.Dein Fleisch-The first single on the album and probably the most polarizing song on the album. It has some simple but effective riffing however it has more of an industrial metal structure not uncommon to bands from the 90s and even has this Rammstein-ish feel in the chorus. The band definitely make it work in their favor keeping it dark and having a quick but very melodic solo included as well. It definitely is a very original song and still keeps the heavy feel that Venom always carried but in a different way. It shows that Venom Inc is about more than playing fast, they write catchy songs that have their own identity such as this one. 5.Blood Stained-This song has a heavy chugging pace going through it with a more melodic chorus that is one of my favorite on the album. The song is quite simple but works effectively creating a heavy atmosphere with the drums especially having that old school heaviness about them. I especially love the very dark bell tolls over a chugging open riff, it is just one of those moments that you can just hear over and over again. 6.Time To Die-Thus is easily one of the most neck breaking songs on the album with the band not letting up one bit and playing literally as fast as they possibly can. It is quite catchy as well and has a very punk atmosphere to it with the chorus being a simple shout of “TIME TO DIE”. There are some great grooving mid paced sections here to which keep the pace fresh. Easily one of the best on the album bar none. 7.The Evil Dead-This song sounds as if it were a bonus track off “Welcome To Hell” but with a bit more of a modern production and the Demolition Man giving some of his best vocal performances on the album. Mantas gives us another great solo as well and another favorite of mine on the album. 8.Preacher Man-Thus song has more e of a bluesy hard rock feel but still has a hard intense feeling about it. There are some smooth slow hazy moments that give the song character notably in the beginning and mid section of the song. Another very solid grooving tune on the album. 9.War- This song hits back with more of a straight thrash attack again done very solid. There are a lot of bouncing riffs which are always welcome, they always make the song very memorable for having an infectious beat. The solo is definitely the highlight of the track with Mantas doing one of the most intricate solo’s on the album and definitely has that classic Venom feel with it but in a more modern sense. This is another track that you cannot pass u[ when you put this album on. 10.I Kneel To No God-This song sticks to a more mid pace again giving the album variety but still keeping things interesting with infectious almost hard rock tinged riffing. The song does have a more laid back feel at least on first listen which makes it one track that takes a few listens to get really into. The chorus is very similar to the verses so it doesn’t hit as hard as most of the other songs but it still is good with some pounding backup vocals. Mantas’ grooving riffing is definitely the stand out of the whole song for me easily. 11.Black N Roll-The final song on the album shows the band going out guns ablaze. Lyrically, it is one of those homage songs mentioning motorhead songs, acdc songs and so on. It has a very Motorhead feel overall even up to the bass intro. It is a very simple song but its so damn infectious with a chorus that is straight out of an old school punk song. It does come full circle in a sense for Abaddon and Mantas as they are back to playing what they started with. Good old Blackened Speed Metal and they brought it back in spades. Overall, I give the album a defining 9.5 out of 10. 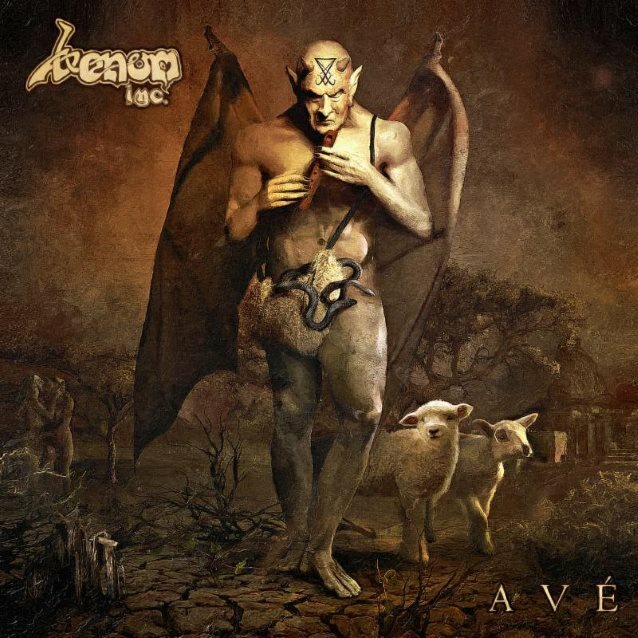 While the album is nothing genre defining(I mean there aren’t many bands that can innovate anymore), this album is history made with two thirds of the original Venom line up reuniting with Dolan since the early 90’s creating an album that has a modern take on an old formula. The spirit that they carried and the magic that bounces off between all three members is still very present creating eleven songs that flow very well with their own style. This album makes me hope that there is more for the band in the future and I can’t wait to catch them in Chicago next month. Ave Venom Inc!